I am not buying the Montage at least not for now, let’s say at least for the next few years. I bought my White Motif XF6 two years ago and still have lots of things to learn from it, beside I do all my sequencing on the Motif, I am not good with computers, the Motif gives me what I need. The Montage has very nice sounds, it was about time to the touchscreen feature, I might consider a rack version if they ever make one. Hi Jote. Note that I said “I won’t be surprised” vs “I expect”. - New, more powerful sound/effect chip, with what looks to be the same “production ramp-up, prepare in advance for next version” approach Yamaha took with MOX (the MOX has the same board as MOXF, the MOXF has the additional components). - Shared opinions on PSRTutorial that Yamaha likes to introduce features on the PSR series, and if successful, integrates with next Tyros version. - Yamaha history of sharing technologies between work stations and arrangers, e.g. a lot of the arpeggios on the MOX/MOTIF come from Tyros/PSR styles; MOTIF DSP technology reused in the Tyros/PSR, etc. - Recurring theme on PSRTutorial and other forums that users want a hybrid music production workstation/arranger. - My assumption that Yamaha is almost certainly aware of what users are talking about on Motifator.com and PSRTutorial.com; during a conversation with a Yamaha Support Rep regarding “Is Yamaha going to update the MOX driver to be class-compliant like they did the MOXF?” (Rep:"Not aware of any plans"), the Yamaha Support Rep stated that he tracks Motifator.com. Does he pass on findings to Yamaha Marketing? IMHO, highly likely - Customer Service is almost always tied to Marketing. - And, finally, implied trend down in Tyros4 and Tyros5 sales (steady reduction of PSRTutorial contributing members, Tyros 3 looks like it’s the most successful revenue generator); Yamaha might feel the need to do something different with the arranger market just as they did with the workstation market. btw, own a Tyros 5 as well as MOX (appreciate Yamaha quality, solid); with the third party software out there, quite a useful composition kick-starter as well as “one man band” performance instrument, either as solo or as a backing instument for vocalist. OK, putting back the brain to posting filter ;) Cheers. I don’t know if you’re a fast or slower tech learner. 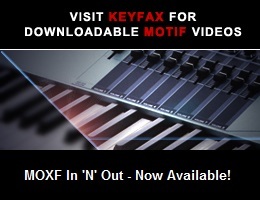 As a 1st time Motif user and 1st time major keyboard user, it was my experience that there is a lot in the Motif XF. There are various support material, including this keyfax run forum. Slowly peel away the sections you’re interested in. And from what I’ve seen of the Montage, so much of the Yamaha way you learn in the XF can be ported over. Do note: the Montage has a few significant perspective changes. And these can be addressed by a “moving from here to there” tutorial. But I do believe the main gist of what I wrote applies. Thanks for the info, but still I am not buying the Montage, the Motif XF gives me what I need, it may not have the best sounds but it does what I need, and it even does quite a lot more. Oh, I wasn’t trying to sway you away from the XF. I was trying to support you on the XF path. I won’t be buying one. I already have an FM synth in my Kronos Workstation, and have no use to buy the same old Yamaha sounds again for $2800 when I have a Motif XF. With no sampler and no user sample editing the Montage its just a basic synth. It’s made for the stage player and not the workstation producer who likes to create and manipulate their own user sounds, instead of having to just playback the stock sounds. The Montage is more like a regular SY77 synth, more then the traditional Workstation over the last 20 years. The Yamaha hardware FM synthesis has always been very expensive for some reason. It seems like for the Montage to compete in the soft synth/Kronos market then it needs to have a price point around what the Yamaha EX5 had at release. I think I paid $6,000 for the SY99 and I paid $2,000 for the EX5 brand new. The SY99 had that super expensive FM engine while the EX5 did not and yet the EX5 had (4) synth engines and the SY99 only (2) same as montage. It seems like that hardware FM engine is way too cost prohibitive to compete in a softsynth market and yet Yamaha implemented it anyway and dropped all the workstation features out of the Montage. By dropping those features one might as well use a softsynth and have a ton more options to work with. Although I love Yamaha gear, I can see exactly why anyone would buy the Kronos over the Montage if the dollars are equal to purchase each. Yamaha shrunk the FS1r FM circuit board down to a tiny (2) post card size so 20 lbs of circuit boards are no longer required to produce a quality FM synth. I’d like to A/B them side by side to hear whether Yamaha can pull off the sound quality edge. Somehow I’m still thinking that the Montage should be in the $2,000 price range to compete and nothing looks better, fit and finish wise as does the latest Kronos. I almost pulled the trigger on their latest version. I’m currently on pre-order with the Montage 8 but I might seriously reconsider unless the price goes way down on the Montage. I’m getting one if the action is not stiff and heavy. Yamaha seems to be getting heavier and heavier with their actions. I bought a P-105 for my daughter just prior to the P-115’s arrival. Glad I did. Less polyphony but better action. Of course that’s just one example. The CP-4 wears me out. Smooth and buttery to begin with but then the resistance takes a tole. It may be that my extensor and flexor tendons are just weak. I need to give them a good workout! As far as the Montage goes. Bad to the bone! But then again I don’t care about the sampler and sequencer. I’m just interested in a performance synth that will inspire. If you shop you can find the Montage 8 for $3200. That’s not bad. I’m really excited about the potential and possibilities with this board. The Montage is the exact same price as the Kronos with 1/4 of the features. The Kronos will easily blow the Montage out of the water even for a slightly cheaper price. 9 synth engines in the Kronos is just incredible. Plus a highly professional and highly intuitive user and sampling interface. The Montage is listed as a synthesizer and not a Workstation in the keyboard category at Sweetwater. I think Yamaha set out to build a synth, and not a Workstation replacement to the Motif. I won’t be buying and it is because the cost of upgrading from my XF is out of my budget. Well, for now, I’m undecided regarding adding the Montage. Since I have the Motif XF7, and other synths both HW and SW to keep me busy for a long time, I don’t plan to sell my Motif XF7, and quite honestly, nothing I saw or heard in the Montage Video presentations/demos made me go ... Wow ! I have to buy the new Montage. It would be interesting to see if Yamaha adds more features by May, and begins releasing additional demos showing the new features during the next few months. Maybe that would make me lean towards buying it, but for now, I’m undecided, and I would even say, I’m leaning more towards not buying it, given I have the Motif XF7, and other great sounding Synths. But this might change, it all depends on what happens once the Montage hits the stores, and I am able to play one, and find out if I fall in love with it. One picky observation concerning the 8 encoders. I repair all Yamaha gear and I might literally have hundreds of those same knobs that are on the 8 Montage encoders. Those “super” out-dated rubber RS7000 knobs showing up once again in the year 2016 all to save 50 cents. Come on Yamaha! Where are the really cool performance style, radical endless encoders grips to really showcase the Montage? There’s 50 bucks in that glowing, multi-colored orb-of-super-knob so how about some retro or futuristic encoder grips? Even though the Montage likely has an improved sound over the Notif XF, I can’t consider replacing my XF with a Montage because of all the music production features they dropped. I wouldn’t consider it as a second keyboard either, because there would be a lot of duplication. If I were to get a second keyboard, I would probably add a 61-key Kronos 2 and continue to use my XF8 as my primary keyboard.